Sure. Celebrate now. Because tomorrow you have to find a real job. Nearly 2 million college graduates will be heading out into the tough job market this spring, and even though job opportunities are growing, the last thing grads need is to make dumb mistakes. Many employers are eager to hire newly minted graduates. 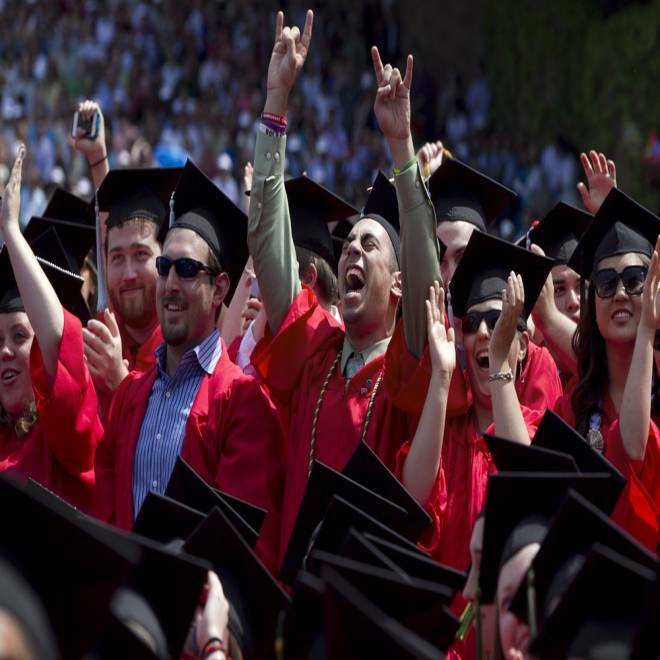 According to a poll by the National Association of Colleges and Employers, companies expect to hire about 10 percent more graduates from the Class of 2012 than they did last year. But that doesn’t mean you’ll easily be able to land the gig you want, because with an unemployment rate above 8 percent you still have to make a good impression. "Recent graduates might be dreading the job market, but if they know the common mistakes people their age are making, they can hopefully avoid some job-hunting pitfalls,” said Josh Tolan, CEO of online jobs site Spark Hire. Relying too much on job boards: Job boards are no subsitute of networking, but don't tell that to most recent grads. Larry Chiagouris, a professor of marketing at Pace University’s Lubin School of Business, has done his own research of graduates and has found that 55 percent still rely heavily on job boards rather than personal connections. Not singing your own praises: One thing grads have to learn pretty quickly is that they have to become their own best cheerleader. “Given the fact that there are thousands of graduates joining the search pool with each commencement weekend, if you aren't able to articulate clearly and plainly why you are uniquely positioned to be the successful candidate, you will not be competitive in the job market,” said Mary Evans, executive director of the Career Center at Hamilton College. Liberal arts graduates, for example, have to be able to convey “how their education differentiates them from the other candidates using real examples of demonstrated leadership, critical thinking, and writing, research and communications skills,” she advised. Wasting your time on the wrong job: Sometimes graduates aren’t quite sure what job they want when they get out of college and end up applying for positions that just sound fun, or lucrative, instead of figuring out what suits their background best. And sending resumes out willy-nilly is also a no-no, said Kristi Milczarczyk, senior recruiting manager of campus recruiting for The PNC Financial Services Group. "It’s good to have a few companies in mind, but new grads need to have a plan to keep their job search focused," she advised. "Same goes for applying to too many positions with the same organization." Can’t let go of mommy and daddy: We’ve all heard about helicopter parents. But for those grads who want to look professional and persuade a hiring manager to hire them, they probably want to leave mom and dad out of it. You may also want to consider leaving the nest. "Don’t volunteer that you still live at home with Mom and Dad if you don’t have to," advised Beth Gilfeather, CEO of Seven Step Recruiting. "Employers would much rather hire people who are out on an edge and have to support themselves." Not cleaning up your digital dirt: Younger job seekers tend to be more social-media savvy than their older job-hunting counterparts. While that can help grads, it can also be a liability if they’ve shared too much of their personal lives online.